Oops - we don't appear to have a video for the CR-50 Cheque Reader. For banks, financial service businesses and retailers that need to process cheque payments at high speed, the imageFORMULA CR-50 is the ideal solution. Compactly-built, it is packed with intelligent software that can be used in the most demanding environments – such as front of branch counters or remote capture agencies, where maintaining a fast and accurate throughput of transactional data is critically important. The CR-50 offers advanced features that are built on Canon’s reputation for innovation and quality in the cheque scanner market. 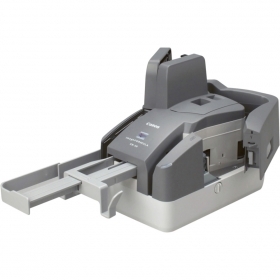 With its ultra-compact design, the CR-50 offers high-speed scanning of up to 50 cheques per minute, precise MICR (Magnetic Ink Character Recognition) reading and a built-in imprinter. Easy to use and maintain, the CR-50 offers a powerful means to boost your productivity and performance. The CR-50 scans at an impressive 50 cheques per minute (B&W) and holds up to 50 cheques in the document feeder – so even the busiest users can work without delays. Its compact design means the CR-50 can sit comfortably on desktops or counters where space is often limited. Equipped with a Canon patented magnetic-head, the imageFORMULA CR-50 can read MICR data with high accuracy for reduced transaction errors. MICR reading is supported by OCR (MOCR) processing to ensure precision data capture, without sacrificing speed. Canon's superior paper handling technology allows mixed-batch documents or single items to be processed at speeds that are consistent, reliable and uninterrupted. For extra reassurance, features such as infrared double feed detection and paper thickness adjustment maximise production levels and ensure that end-of-day processing deadlines are met. Even under demanding workloads, the CR-50 is able to process up to 2,500 scans per day. The CR-50 is designed with a side-opening cover that allows for easy maintenance reducing the need for costly off-site servicing. The useful Remaining Ink Alarm feature lets you know when the imprinter cartridge will need replacing, so you can plan and budget ahead. To help you monitor performance, the CR-50's Data Logging Tool lets you track key performance metrics, such as the total number of scans, double feeds, imprint numbers and the LED's hours of use. Canon's Scanning Utility software enables fast and intuitive cheque and image capture, file saving, image viewing and additional functions – helping you scan data into your workflows quickly and accurately. Using the industry standard Ranger driver based on Silver BulletTM, system integrators can easily incorporate the CR-50 into cheque processing workflows; while the Software Development Kit (SDK) enables developers to integrate the CR-50 seamlessly with custom software applications. Firmware updates are straightforward to execute, with both driver and firmware upgrades achievable in one update file.